I have an antique Solid Oak Pedestal Dining Table. It was my great grandmother's - circa 1890 to 1900. It is 48" Round with Two Leafs that are 12" inches each that make it an oval - 72" . 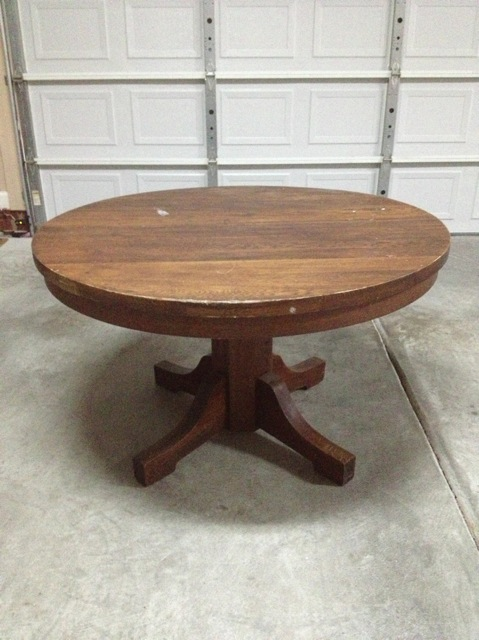 The Round Table is in good shape but needs refinishing. The Two Leafs are ok but need some work (one is chipped). Thanks! 48" inches in Diameter expands to 72"
This was my Great Grandmother's dining room table - Circa 1890 -1900 - Needs refinishing.